PromotePictures - Effective social media promotion app - Post picture collages to Facebook, Twitter, Instagram, Google+, Pinterest and Tumblr to drive much more traffic to your online store and make more sales! 5 day free trial. No credit card required. Login in with your social account and start posting collages. PromotePictures needs your permission so it can send post picture collages on your behalf to your social accounts. When you sign up with your social account, the app will take you to social network web site for permission. The app only sends out collage posts on your behalf. The app does NOT do any other writes to your social accounts. You have 100% control over picture collage posts. The app does NOT post anything to your social account without your action. After you sign up or login with one social network account, you could connect to your other social network account. When you connect your other social account(s), the app will also take you to social network site for permission so the app could post picture collages on your behalf. Desktop app: Install a browser extension and you will be able to post picture collages from your desktop. We support Google Chrome, Apple Safari and Firefox. After installation, there will be a new extension button on the top of your browser. Mobile apps: Download PromotePictures mobile app and post picture collages from your mobile phone or tablet on the go! We support iPhone, iPad and any android devices. You have installed the extension! Desktop: Login to PromotePictures.com first, then go to any of your shop pages. Click on the extension button on the top of your browser. The app will extract pictures from your shop page and create a picture collage automatically. Once the picture collage is displayed, you can post the collage to Facebook, Instagram, Twitter, Pinterest, Google+ and Tumblr. You can also save the collage for later use. You may customize picture collage by adding/removing pictures or re-arranging pictures. After your free trial is over, you will be on the free plan automatically . If you like to continue to use all the features, you may subscribe a paid plan. We accept both PayPal and credit card. You may sign up for a monthly plan or an annual plan. "I've seen a HUGE increase in traffic to my shop..This is an outstanding app!" "I cannot say enough good things about this app. I use it on ebay items, etsy items, ebay collections and ebay store categories! It is brilliant & fast!" "An all time favorite app. I love the professional look of the collages and can use it in so many different ways. I use it for eBay items, eBay Collections, Pinterest boards, promoting blogs, and probably something else!" "I love this app! I use it to promote my ebay items, ebay collections, ebay store categories and highlight certain items I want sold. And they sell by using this app. I use the Auto Tweet most of the time but you can also tweet just once. I can't say enough about this great app and I must say, their Customer Service is the best I've ever come across on the internet. Keep up the good work!" "Wonderful app! 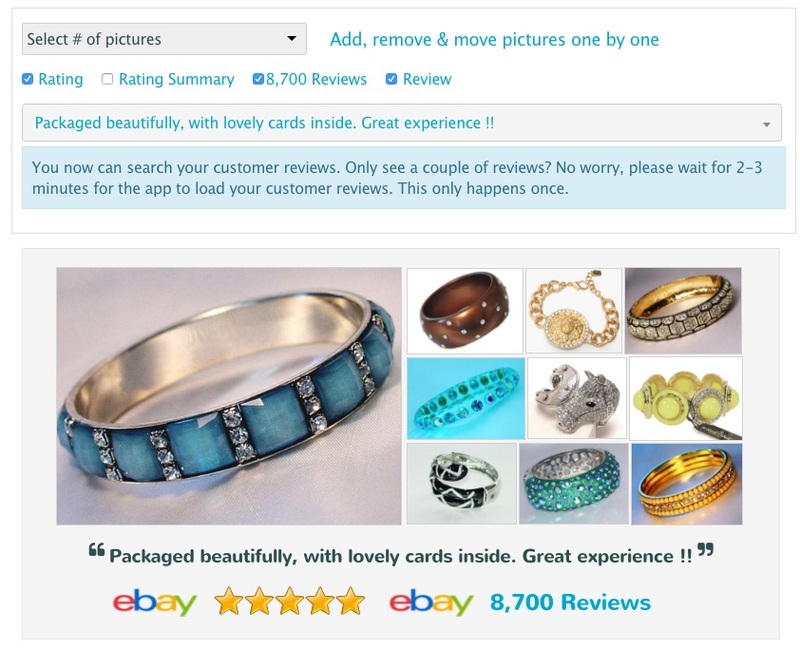 I love how easy it is to tweet and pin picture collages of the items in my eBay and Etsy store. I have also used it to help out one of my close friends who is a musician. Tweeted out a collage of his upcoming gigs. Great App! A++++." "One of my favorite social media tools! Creates beautiful aesthetically pleasing collages and promotes on social media with literally the click of a button. A huge time saver and a must for social media marketing. Plus the customer service is superior! Highly recommend." A picture is worth a thousand words. A picture collage can showcase a mix of different items or one item but with different pictures. Picture collages attract a lot more user attention and social media users will engage with your picture collage posts more. Post picture collages to all your social accounts is the best way to promote your store and products on social media. PromotePictures extracts all the pictures from your product page and automatically create a picture collage with the best layout. 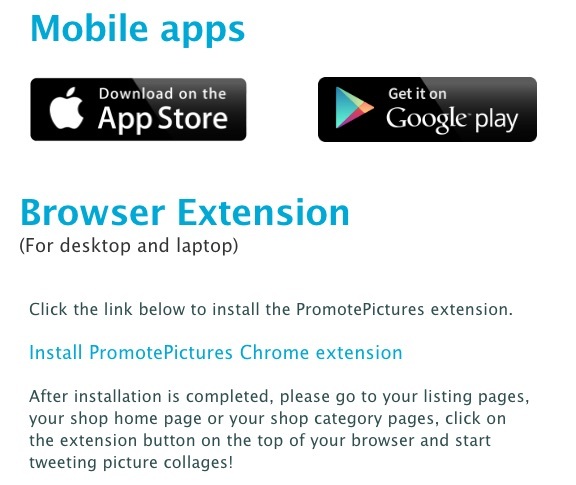 PromotePictures extracts all the pictures from your shop page and creates a picture collage. You can customize by adding/removing pictures, or re-arranging pictures. Promoting your curated content in picture collage format is great way to sell your products on social media. Different social media have different picture size requirement for Best display. PromotePictures automatically create collages in different sizes for optimal display on all social media. Picture collages help generate viral click traffic to your shop or web site. More traffic you can get from your picture collage posts, more people will buy from you. Why does the app require my Facebook permission? Even though you grant the above permissions when you login in with or connect to your Facebook account, the app does NOT publish posts without your actions. In order to post anything, you will have to select your account and click "Post Now" button physically. Furthermore, the app does NOT do any other writes to your facebook account other than publishing picture collage posts on your behalf. Why I need to login or connect to my personal Facebook account? Once you login or connect to your Facebook account, you will need manually select your business page account or sales group account for posting. The app does NOT publish posts to any account without your actions. Can I post picture collages to my Facebook business page account(s)? Yes. That's what this app is designed for. 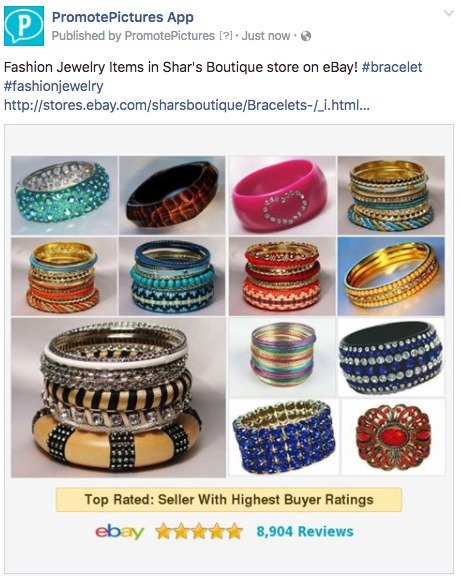 Once you connected to your Facebook account, PromotePictures will retrieve your Facebook business page account(s), When you post, you will need to select your business page account from a drop down box. The app does NOT publish any posts to any account without your actions. 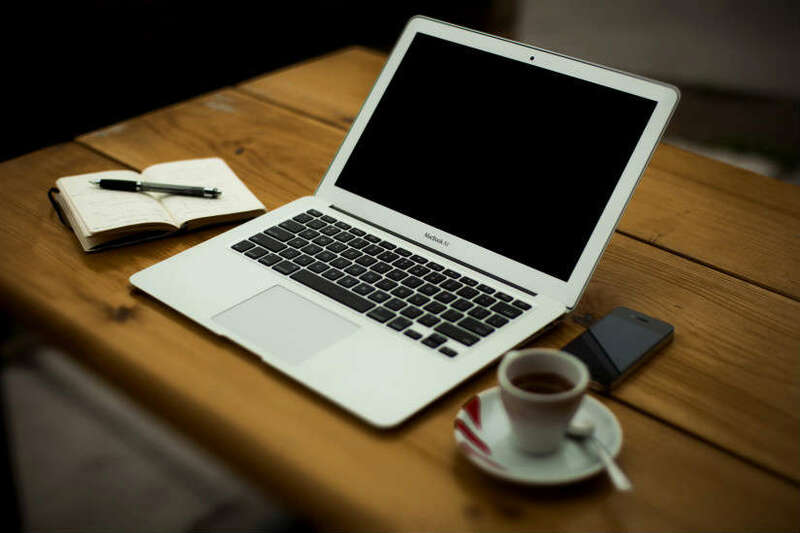 How do I select my Facebook business page account? Why does the app require permission for my Twitter account and/or Tumblr account? PromotePictures require write permissions in order to post picture collages on your behalf. Even though you grant the write permissions, the app does NOT send out posts without your actions. In order to send out posts, you will have to click a button physically. Again, the app does NOT do any other writes to your social accounts other than sending out picture collages on your behalf. Why does the app require my Pinterest account permission? PromotePictures require write permissions in order to post tall collage pins to your Pinterest account on your behalf. Even though you grant the write permissions, the app does NOT post pins without your actions. Does the app do anything else other than publishing posts or tweets on my behalf? No. The app only publishes picture collage posts to your social accounts on your behalf. Do I have control over which item to promote? Yes. You have 100% control. You will need to go to your store page that you like to post first, then click on the browser extension button to post picture collages from your browser on your computer. The app will then send picture collages to your social account on your behalf. Does PromotePictures promote my shop on social network? No. We don't promote your shop. Instead you use PromotePictures app to post picture collages to drive better user engagement and more traffic to your shop through your social accounts. Can I promote more than one shop? Yes. You can post picture collages from as many shops as you like. However, all the posts can only be posted to one social account for each social media. You can post to all the Facebook business pages and all the groups you manage under your Facebook account. Desktop:Make sure you use one of the supported browsers. We support Chrome, Safari, and Firefox. Install a browser extension to your browser. An extension button will appear on the top of your browser after installation. Go to your product listing page or your shop page, click on the extension button to tweet or post to Facebook immediately, save the collage for later use or schedule the collage tweet. Mobile:We support iPhone, iPad and any android devices. How do I install a new version of the extension? The best way to install a new version is to remove old extension from your browser and then re-install it. Below are some links on how to remove old extension from your computer. Is payment information required for free trial? No. We only need your payment information when you decide to subscribe to a monthly plan or an annual plan. When does my free trial begin? You free trial begins once you login with your social network account - Twitter, Pinterest or Facebook. What happens after free trial ends? You will be on the free plan after your free trial is over. You may sign up for a paid plan to continue to use all the features. We currently accept PayPal and major credit cards such as Visa, MasterCard, American Express, JCB, Discover, and Diners Club. No. We do NOT store your credit card information except last four digits. We use for credit card payments. We are a group of social media geeks, software engineers and e-commerce lovers located in Boston, MA. We like to build apps to help people do things faster and better. We specialize in social media and social selling. We believe pictures are most important marketing asset for social selling. We like to provide great customer experiences for all of our users. Thank you for contacting us! Feel free to send us any feedback you might have.